And fans have been showing her some serious love. When Bella Thorne and Gregg Sulkin announced that they had split earlier this month, people (yes, including us) were pretty upset about it. But now, Bella has taken to social media to thank fans for their support, as she's come out as bisexual after posting a photo of her kissing a girl. 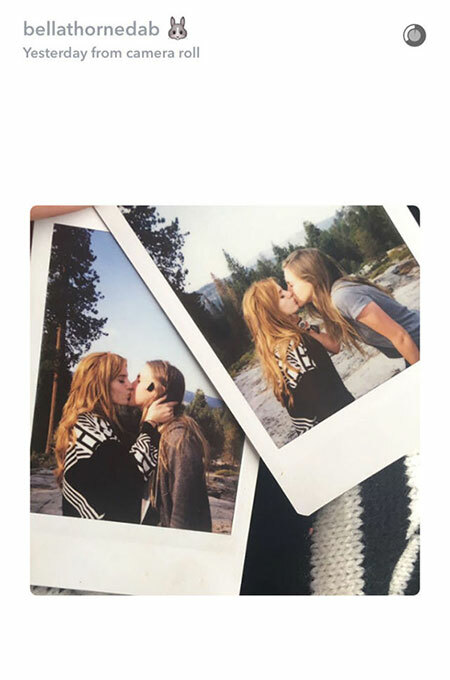 The actress' Snapchat post led to her opening up about her sexuality on Twitter, as her followers began asking questions over the snaps of her sharing a kiss with a woman. Replying directly to a fan who asked if she was bisexual, she simply explained: "Yes." Previously, the star had dated English actor Gregg Sulkin for a little over a year, and the two were constantly giving us feels with all their Instagram PDAs. When the pair announced their breakup in a joint statement to People, they revealed that they'd decided to end their relationship "after much thought and soul-searching." They told the magazine: "We will always love each other and have a deep respect for one another, as we have each grown to be better people because of our time together. Our schedules made seeing each other difficult, and we decided that for now this would be best." Despite the kissing photos, Bella also seemingly confirmed that she is still single, after she asked a lucky fan "why wouldn't you have a chance?" in reply to his tweet saying it's his life goal to date her.